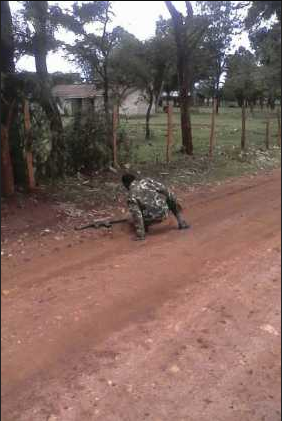 Being a Kenyan policeman must be very frustrating. Working long hours and being paid 'peanuts' is what they have to live with. What is even more difficult is the thought that senior government officials are looting billions that could pay police officers and improve the services to the mwananchi. One police officer was recently spotted unwinding after a hectic day at work, the day must have been so tiresome that he couldn't even go home and change before going to the local tavern. 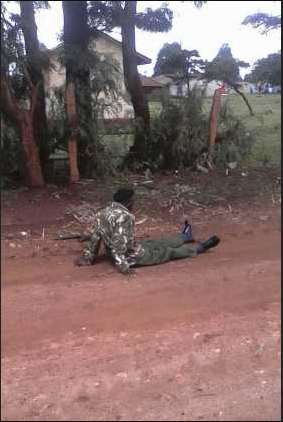 He was seen staggering on the road wearing full uniform and a gun which was too heavy to carry. The people who saw the cop claim he must have drunk too much to a point where he couldn't even carry his rifle and had to drag it along the way.